Everyone knows what it is to be afraid. But phobias take the normal (and even helpful!) human emotion of fear to a much more visceral, even primal, place. For some people, it’s a spider that does it. For others it’s a clown, or a trans-Atlantic flight, or even just a puddle of water. It’s the thing that stops us in our tracks, sets our hearts racing, and stands our hairs on end. 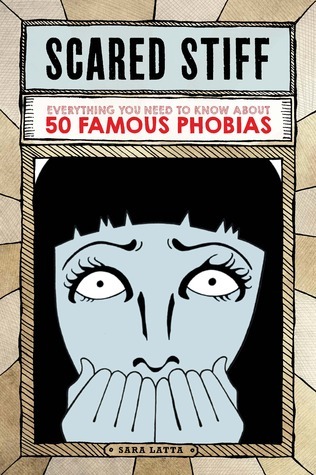 Scared Stiff takes readers on a journey through these experiences—using biology, psychology, and history (not to mention pop culture) to explain where our phobias came from, how they affect us, and how we might eventually overcome them. This is a fun and easy-to-read guide on 50 different types of phobias. The phobias are listed in alphabetical order and include the Greek and Latin terms from which they originate. There are interesting little tidbits of information along with quotes and a mention of phobic celebrities. Author Libba Bray is afraid of dolls (pediophobia). 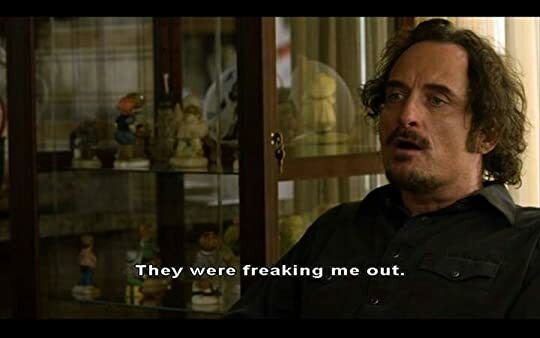 Stephen King says, “Dolls with no little girls around to mind them are sort of creepy under any conditions.” I’m a little disappointed that Sons of Anarchy creator Kurt Sutter’s pediophobia was not mentioned, nor the fact that he gave it to his character, Tig. I was familiar with many of the phobias, because I have mild versions of two of them and know people (or read about people) with some of the others. My discomfort with large, crowded spaces (agoraphobia) can probably be attributed to a trip with my dad to the Bronx Zoo when I was 8 years old. He held my hand most of the time, but let me go while he was taking pictures. A large group of kids crowded in front of the elephants my dad was photographing and we ended up getting separated. I panicked when I couldn’t see him, so I tried to get around the kids. A man walking ahead was wearing a black and gray tweed winter coat and a black fur hat with earflaps, just like my dad, so I ran up to him and grabbed his hand. When he looked at me, I realized he wasn’t my dad. Just before my heart dropped out of my chest, my dad grabbed my hand and scolded me for wandering off. A more recent experience is mentioned here. I can’t say I’ve had any negative experiences with spiders (arachnophobia), but I’ve had a love-hate relationship with them for a long time. I’m fascinated with them when I look at pictures or see them in enclosed displays. When they are jumping, creeping around, or emerging from hidden places, I totally freak out. When I moved out of my last apartment, the easiest way to move boxes of books I had in the basement was up a short flight of stairs and out through the bulkhead door. Knowing there were lots of long-legged spiders and their hideous webs there, I lugged the heavy boxes up the steep basement stairs, through the kitchen and out the door. I’m still not sure why I loathe spiders, but don’t suffer a fear of snakes (ophidiophobia). - Urophobia (fear of urination) – This fear occurs more frequently in men than in women. - Coprophobia (fear of defecation) – While I’m not a major sufferer, I feel uncomfortable doing my business in crowded restrooms and try to avoid it when possible. - Taphophobia (fear of being buried alive) – Before stethoscopes were invented, this fear was very legitimate! Shortly before his death in 1875, Hans Christian Anderson asked a friend to make sure his arteries were severed before he was buried. In the back of the book, the author includes tips on overcoming your fears, including seeking professional help, and a list of resources.